Sergeant Nickolas A. Mueller, 26, died October 26, 2009, when his MH-47 Chinook helicopter crashed while conducting military operations in western Afghanistan. SGT Mueller was born January 21, 1983. He was a native of Little Chute, Wisconsin, and volunteered for Army service in June 2004. Following Basic Training at Fort Jackson, South Carolina, and Advanced Individual Training at Fort Eustis, Virginia, SGT Mueller served with the 2-52nd Aviation Battalion at Camp Humphreys, South Korea, as a medium helicopter repairer. In 2007 he successfully assessed with the 160th Special Operations Aviation Regiment (Airborne) and assigned to 3rd Battalion, 160th SOAR (A), in Savannah, Georgia, where he served as a helicopter mechanic in D Company and as a flight engineer in B Company. He was a combat veteran with three deployments, all in support of the Operation Enduring Freedom. 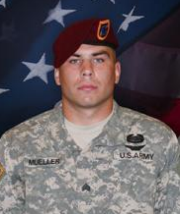 SGT Mueller’s military training includes the Warrior Leader Course, Special Operations Training Course, Combatives Level 1 and the Survival, Evasion, Resistance and Escape Course. Sergeant Mueller’s awards and decorations include the Air Medal, the Army Good Conduct Medal, the National Defense Service Medal, the Korean Defense Service Medal, the Global War on Terrorism Service Medal, the Noncommissioned Officer Professional Development Ribbon, the Army Service Ribbon, the Overseas Service Ribbon, the Combat Action Badge, the Basic Aviation Badge and the Expert Marksmanship Qualification Badge (Carbine). He was posthumously awarded the Bronze Star Medal, the Purple Heart, the Meritorious Service Medal, the Air Medal and the Combat Action Badge. Sergeant Mueller is survived by his parents, Larry and Sharon and his brother, John.